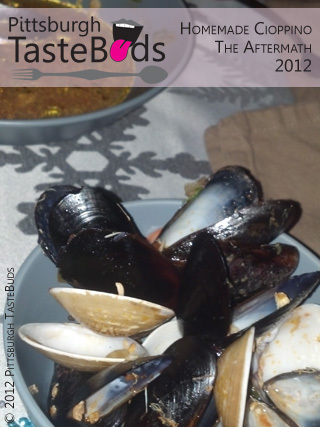 As I searched the Pittsburgh TasteBuds blog history today for the recipe that I used for our traditional “Feast of Seven Fishes” Cioppino that TasteBudA and I have adopted as our Christmas Eve tradition. The only remnant was The Making of a Christmas Eve Dinner Tradition. I’m puzzled. 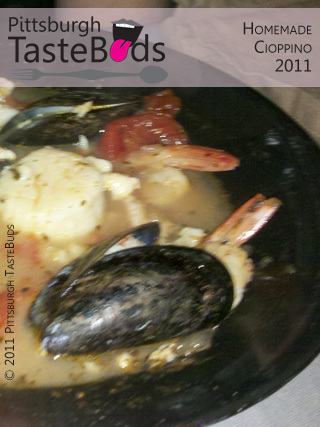 I have taken pictures of our Cioppino each and every year. Have I been slacking that much? Apparently, yes. Each year I think I’ve gone through the same motions: Find recipe. CHECK! Select 7 fishes. CHECK! Combine and cook. CHECK! Take a photo. CHECK! Post about it. Oops. This year will mark the 4th year that we will have made our Cioppino, but apparently we never really blogged about our experience making it. As I go back through the timewarp that is my photos folder, I share with you what little I found today.